Best Golf Putters Available in 2019! 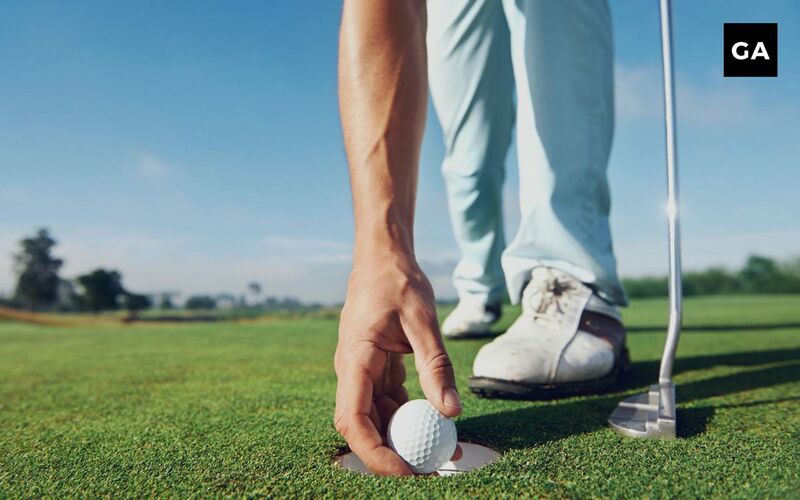 Putting can be a stressful experience for many golfers and a simple upgrade or change of equipment can be a quick and easy fix. Putters are an unavoidable club so learning how to use it is going to be the key to finishing off a hole strong and going into the next hole with confidence. Technology is always evolving with golf equipment so let’s take a look at the best golf putters available. Following the product reviews is a detailed buyers guide with all the key information you’ll need to make an informed decision. 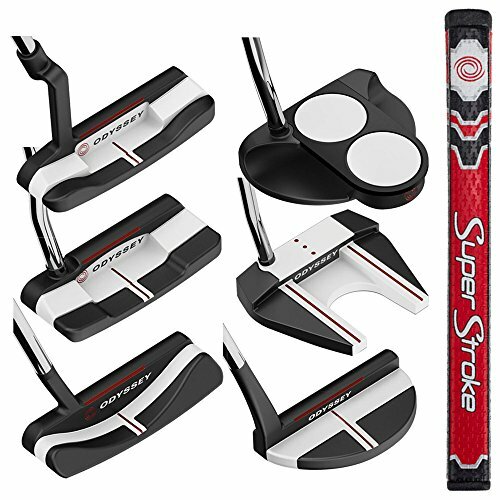 TaylorMade N1537627 Big Red Daytona Super Stroke Putter, Right Hand, 35"
The Callaway Odyssey Hot Pro 2.0 is blade putter with a white hot insert making this a heel/toe weighted putter. Amongst other features this putter has a full shaft offset, EyeFit system, crank neck hosel and alignment aids. An incredibly popular blade putter, it feels good, sounds good and performs consistently. The 2.0 model offers an improved version of the white hot inserts via laser milling cutting to ensure the inserts have a tight tolerance. Suited to amateurs and all the way up to professionals the putter can be bought for both right and left handed orientations as well as in three sizes – 33 inches, 34 inches and 35 inches. The heel/toe weighting in this putter offers more forgiveness and more response. Along with the alignment aids, consistently achieving accurate shots is possible. Designed with a full shaft offset, this ensures your hands remain ahead of the ball. This directly leads to an upward strike on impact with the ball. Overall the Callaway Odyssey Hot Pro 2.0 putter looks good, is affordable, well reviewed and performs consistently. TaylorMade Big Red Daytona is another well priced, quality putter that has a slightly bigger face than others. Increasing the head slightly increases the stability at impact. This is great if you tend to move slightly through your swing or accidentally connect off center. A larger head means very little speed will be lost if you do connect in the wrong spot. Perimeter weighted, the putter also has a cavity that is filled with lightweight thermoplpastic foam. This is sealed with the red bar that is visible behind it. A very clear and easy to see red and white alignment line makes it easy to line up your shots. Available in right and left orientation as well as 33 inches, 34 inches and 35 inches in length. Overall the TaylorMade Big Red Daytona is great value for money and has only positive customer reviews. The head is extremely stable to use and the alignment lines make it easy to line up accurate shots. If you follow the tour the TaylorMade TP Putter was the putter of choice for Rory McIlroy who gained 10 strokes on the greens vs. the field in the week of the Arnold Palmer Invitational. With a pure roll insert this is designed to increase topspin and improve the forward roll. The insert is soft yet feels solid to use. Machine crafted and skim milled from 303 stainless steel this is a high quality putter. There are sole weights for enhanced feel and stability as well as well positioned sightlines for accurate alignment. Available to buy in four different shapes – Ardmore 3, Juno, Mullen and Soto as well as two different grips and two sizes to choose from 34 inches or 35 inches. The ability to choose from four shapes makes it accommodating to a range of golfers and putting styles. 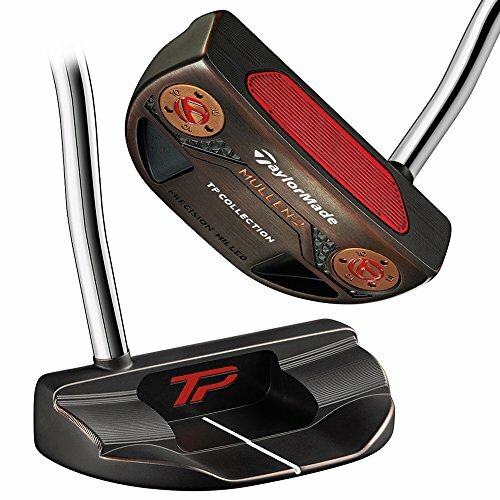 The TaylorMade TP Putter features copper accents which are a result of hand polishing the club giving it a dark, rustic finish. This putter works for professionals and will definitely help beginners and everyone in between. 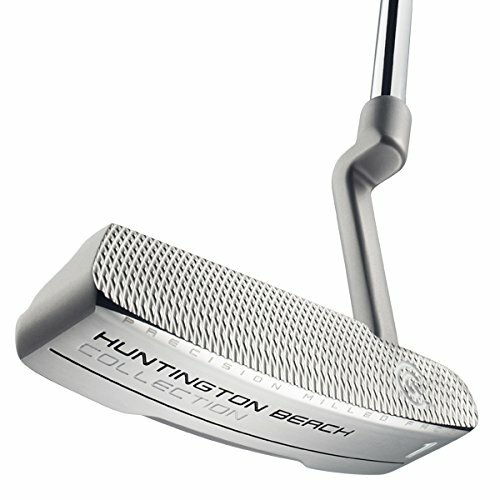 The Cleveland Golf Men’s Huntington Beach Golf Putter is an entry level, affordable and quality blade putter. A precision milled face offers a softer feel and a more consistent roll, made from 304 stainless steel. 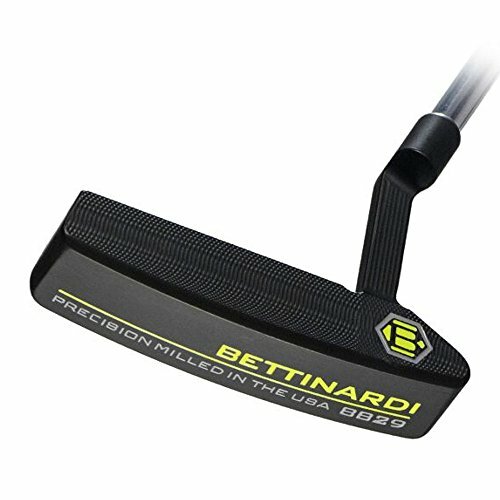 This putter feels comfortable in your hands and the aggressive milling pattern makes it unique. The frame tucks perfectly behind the ball while the sight line makes it easy to align shots. An all-rounder the is affordable and a quality putter that has a precision milled for a softer ball impact and increased friction for a more consistent roll. A classic blade putter design, this has a plumbers neck along with soft, curved edges. Available in left and right hand orientation it can be bought as a 33 inch, 34 inch or 35 inch club. 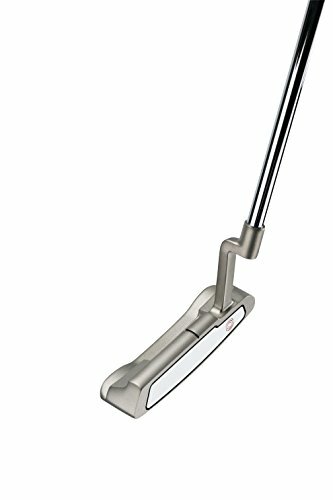 The Cleveland Golf Men’s Huntington Beach Golf Putter is a well priced, blade putter that is comfortable to use. The Odyssey White Hot RX putter is a combination of white hot insert technology and a dual layer injected molded insert. These two features work together to provide a softer core offering a comfortable to use putter. A textured clear coat has been added to the oval striking surface which increases friction to get the ball rolling faster. Very well balanced this putter offers a smooth stroke. Choose from standard or superstroke grip as well as six different putter shapes! Available in 33 inches, 34 inches and 35 inches this putter can be bought for both right and left hand orientations. If you are looking for an affordable putter that offers a more consistent roll then the Odyssey White Hot RX putter is a good choice. 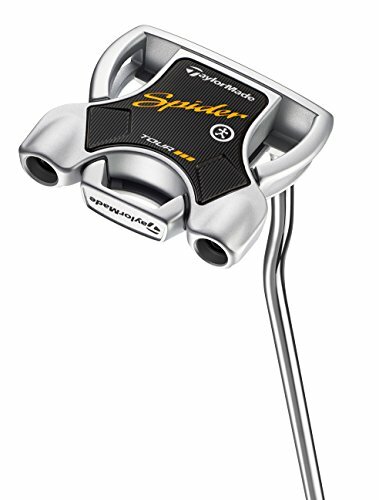 The TaylorMade Spider Tour is a mallet style putter that has spider arc geometry to provide a high MOI (Moment Of Inertia) for better stability, alignment and forward roll. Lightweight, an aluminum body along with a heavy stainless steel ring works together for a higher MOI. The higher the MOI the more forgiveness offered by the club. The soft surlyn pure roll insert works to increased the forward roll and offers better distance control with the soft putter face. Arc technology combined with three sight lines really does benefit your alignment. The pure roll insert is milled aluminum with an engineered design and angle to optimize the topspin of your ball. A face balanced mallet, the total weight of the head is 360 grams. Being face balanced this putter is ideal for those with a straight back and through stroke. There is also foam padding between the body and frame which offers good energy absorption yet it still produces a nice sound upon impact. Although the putter comes with moveable weight technology most golfers tend to use the stock weights. 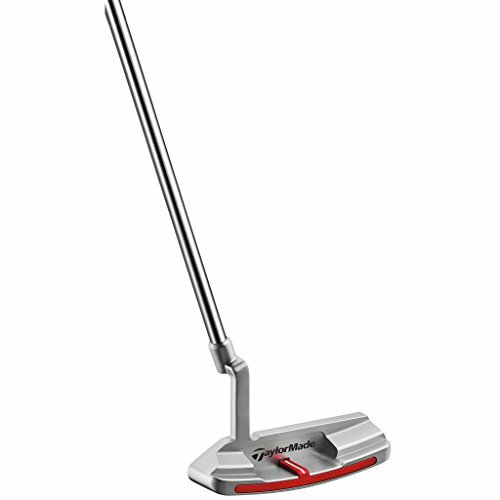 Available in a wide variety of shapes theTaylorMade Spider Tour putter offers excellent value for money. The Callaway Odyssey O Works Putter uses a stainless steel micro hinge plate insert technology to provide gains in topspin and roll. The hinges on the plate are designed to flex and rebound upon impact which generates the topspin to get the ball moving. Additionally, there is a thermoplastic elastomer lining to give the putter a soft feel. Setting up and aligning your shots is easy withe the versa alignment technology. Available in 9 different shapes this putter will help high handicappers and average players to generate more forward roll. With Versa T red alignment this makes it easy for those who like directional assistance. The Odyssey O Works putter also come with a premium SuperStroke grip with a flat front and stitched rear. The Callaway Odyssey O Works Putter is a quality putter that uses a unique insert technology of a hinged plate to improve flex and rebound and thus topspin. A premium putter the Scotty Cameron 2014 is highly rated and a consistent performer. A precision milled single piece the entire piece is made from quality stainless steel as opposed to an insert. Simplistic in design, the putter goes back to basics with just the one alignment line. Exceptional quality this putter has an excellent finish and near faultless performance. Factory adjustable weights have been added to the design with allows for the ideal weight for length combination. This along with an improved high toe profile as well as heel and toe weights provides increased stability by reducing any head rotation for off center impacts. Raising the toe is a common problem with golfers which causes you to aim left of the target (for right handers), the technology and profile of this putter work to fix that. 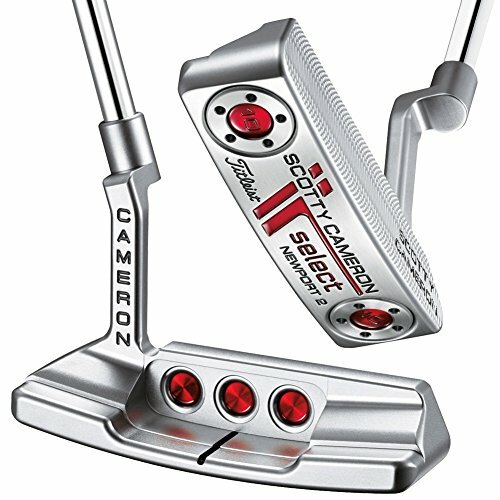 The Scotty Cameron 2014 putter is a high quality putter that has a smaller grip and deep milled face design. The finish makes this a timeless piece and the balance and stability of the weights are matched perfectly with the shaft length. The Cleveland Golf Satin Elevado is a counter balanced putter with an oversized grip. With improved speed control and perfect alignment this putter offers great value for money. Cleveland engineers have fine tuned their putters to align the sight line with the exact center of the golf ball. This also for precision play and accurate shots. Improving distance control and performing on mis-hits this putter uses a different milling pattern to optimize the MOI. Improving the MOI improves the speed control regardless of if the sweet spot is hit or not. The milling pattern is also three times deeper than the previous models and this along with a polymer TPU insert works to create a soft putter. The Cleveland Golf Satin Elevado is a face balanced putter with a head weight of 405 grams, loft of 3 degrees and lie angle of 70 degrees. Available in 35 inches or 38 inches the purchase also includes the oversized grip. The Bettinardi BB series Blade Putter is a newly designed putter to enter the market with a few key features. While the BB series has been in the Bettinardi repertoire since the late 1990’s this range offers innovative technology to set it apart from the rest. A durable matte black finish and a deep-etched lamkin corded grip this putter is eye catching yet high quality. The super-fly mill face offers a very responsive feeling and will help to create a more consistent putt in terms of speed. Featuring heel to toe weighting the blade has been updated with a soft carbon steel head. The indented neck allows golfers to position their hands further forward through the stroke. A favorite putter amongst many, the Bettinardi BB series Blade Putter is a simple yet well crafted putter that performs time and time again. The putter is milled in the USA this and presents great value for money in this price range. The Toulon Design Austin Putter is a high quality putter manufactured by Callaway. With smaller shoulders and tall back bumpers this putter is stylish and functional. The putter has a 45 degree toe hand which is ideal for golfers who have a slight to moderate stroke arc. Pre-installed in the putter is an aluminum sole plate which brings the total weight of the head to 349 grams. 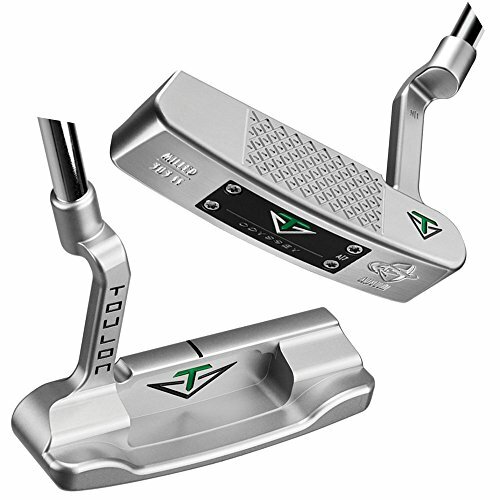 This high end milled putter is compared and rivalled with the Scotty Cameron putter. The Toulon Austin comes stock with a H1 hosel and top line adjustment aid. A deep diamond milled face pattern comprises of deep cross-hatch grooves that control the sound and feel by channeling the vibration in each diamond pattern. This directly improves the quality of roll. The Toulon Design Austin Putter is a high quality putter with the price tag to match. The deep diamon design on the face offers excellent vibration absorption without compromising the crisp sound upon impact with the ball. The final putter to make the list, the Titleist Scotty Cameron and Crown is an excellent quality putter with the price tag to match. 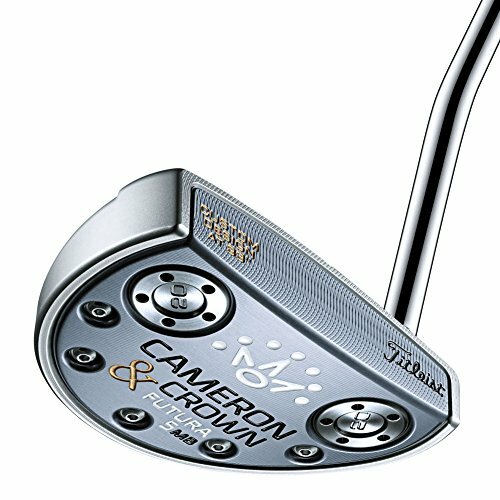 Cameron and Crown seem to be continually enhancing their putters and the Scotty Cameron is included in that list. TheTour proven quality, this putter offers a premium design with properly weight heads and a small Matador grip. These work together to provide a precise swing weight for optimal feel and balance with each swing. A combination of 303 stainless steel and 6061 aircraft grade alumium everything about the construction of this piece has been cared for. With a raw stainless steel finish and unique silver mist treatment this is a glare resistant putter. The Futura 5MB is an elegant rounded mid-mallet that has face sole technology for optimal use. Titleist Scotty Cameron and Crown is a top quality putter than will perform exceptionally well with each use. The Futura 5MB design is a mid-mallet shape for comfort and ease of use. The design of putters typically focus on two things – the shape and weight and there are many variations of this combination. Generally, they are either face balanced of toe balanced. If you were to balance the shaft on your finger, these putters have an upwards curve to them. The center of gravity in these putters is below the axis of the shaft. If you have a straight putting stroke, these are ideal as they tend to open less on the backswing and close less on the follow through. If you were to balance the shaft of your putter on your finger the toe will be pointing toward the ground. Meaning, the center of gravity is not directly below the shaft axis in the club. These are ideal for those with an arc in their stroke, with the tendency to open and close throughout the stroke. Shapes of putters varies from thin to mallet style and this can greatly effect your confidence. Many players have preferences in terms of shapes and what works. Some people find certain shapes distracting and it affects their swing. Generally, you should match your putting with your natural putting stroke path. The shape is a personal preference so testing a few out can be a good idea. Blade – The shape of this putter is rectangular with the shaft extending from the heel of the putter. The toe tends to have an upward angle or slight curve. This type of putter is the traditional putter that has a simple and flat look. Generally blade putters are face balanced. Heel/Toe – This style putter normally has extra weight at either end. This is more or less the same design as a blade putter but the weight distribution will help you stay straight. Many of these putters allow for tweaking the weighting to adjust for different swing paths. Mallet – The deep shape of these putters creates a low center of gravity which can reduce spin if you hit your golf ball off center. The back of these can vary from a rounded back to a more square shape and again, mostly it comes down to personal preference. Although the function is the same for all putters there are many different considerations that can affect your game play. In the following I will highlight what I consider key features to look for. Different putter face materials can help you to achieve different things. Take for example, a golf course that has fast greens, a softer material on the face of the putter could be beneficial. There are three key face materials to look at which all have a different feel when in use. Metal Face Putters – A variety of metals can make up the putter face including steel, bronze, aluminum, copper, zinc or titanium. Metal faces can also have a rough or grooved surface which provides traction, reduces skidding and can provide the required topspin needed. Some people prefer the sound a metal face putter makes when connecting with the ball. It gives you the opportunity to feel and hear how you connect with the ball easily. Insert Faced Putters – Generally these putters offer a good redistribution of weight across the face of the putter. These are typically metal face putters that have a light weight, non-metal insert in the face. Made from softer materials than metal faces these provide a soft strike which you can feel and hear the difference. With an insert face you won’t hear the same connection as a full metal face which some people don’t like. Combination Face – A combination of metal and insert faces, the softer material is encased in the metal. This is a popular choice as it offers a good balance between the solidity of metal and softness of an insert. The material of a putter is generally steel which gives a solid, consistent and very strong feel. There are two options with the hosel which is where the shaft and putter head meet. Heel-Shafted Putters – With a heel shafted putter the shaft will connect directly at the nearest end to the golfer. Center-Shafted Putters – The center shafted putters connect in the center of the head as opposed to the heal. There really is a clear winner in terms of the center of heel shaft connection, it all comes down to personal preference. Some people prefer center shafted putters to guide the ball straight to the hole. The length of your putter should be matched to your height for optimal results. With the wrong length your putting will be inconsistent and can lead to bad posture. Putter shaft lengths are measure from below the hosel, along the sole of the putter to the top of the shaft. A putter must be a minimum of 18 inches long but there is no maximum length so feel free to try a few different putters. The most commonly bought putter is a belly putter, which as you may have guessed comes up to the belly. Measuring between 32 and 36 inches a traditional putter is a very common choice. Tried and tested throughout the history of golf these help to create a consistent pendulum swing. Measuring between 41 to 46 inches these are currently the most popular putter lengths. Offering extra stability with the choice of a third point of contact – the belly. it must be stated that anchoring the putter to your belly is now not legal in any sanctioned competition. There is still the option to use this as a longer putter without using the third point of contact. Measuring between 48-52 inches these are not overly common but do work for some people. To use this putter you need to change your grip which can really throw some users off. If you are looking for the best putter grips be sure to read through my detailed review! I included putter grips which do differ from your standard club grips. Putter grips are the only ones that can have a flat edge. A lot bulkier and significantly thicker these grips reduce any wrist action in your swing. Either way if your putter grip isn’t working for you, they are easily replaced. Choosing the best golf putter can be a somewhat perplexing task. There are many different shapes and sizes to choose from. The information provided in this post should be all you need to make an informed decision. I have done my best to include only the best products so read through them all before making your choice! Putting can make or break your round of golf, finishing a hole strong provides you with confidence going into the next hole. A new putter may be all you need to adjust your scores, change your mental game and re-define your golfing abilities. Set your budget and read through my detailed reviews before making your decision.